New York Times building in 1906. Photo from Untapped Cities. Times Square has become so synonymous with New York City that many visitors and residents alike don’t stop to think about where the name came from. 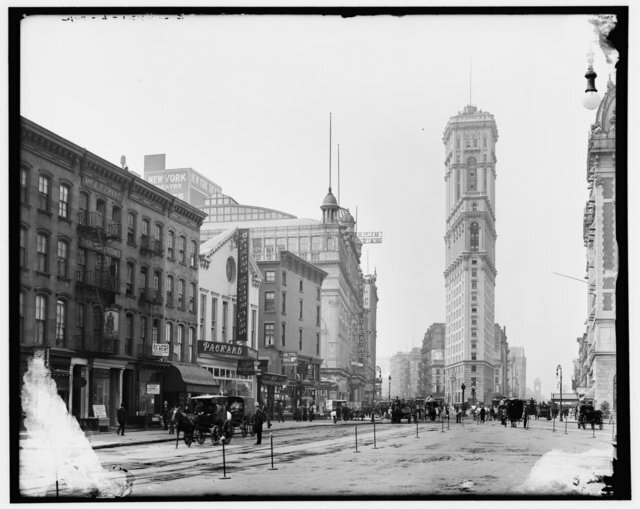 This origin story goes back 111 years, to April 8, 1904, when Mayor George McClellan renamed Longacre Square for the proud newspaper that had just relocated to the block. The name Longacre Square dated back to the 1870s, when the uptown carriage hub was named after Long Acre Square in London, where carriages similarly congregated. Longacre was at the heart of a neighborhood broadly known as the Tenderloin, or Satan’s Circus. In 1901, the area from 37th to 47th street, from 5th Avenue to 8th Avenue, was home to 132 brothels and at least as many saloons. On the less shady side of things, Oscar Hammerstein had a multi-theater entertainment complex there called the Olympia. Sounds like a wild scene. Throughout the 19th century, newspapers had been housed quite comfortably on Park Row, also called “Newspaper Row,” across from City Hall. During the 1890s, the main rivalry was between the New York World, run by Joseph Pulitzer, and Williams Randolph Hearst’s New York Journal, as we discussed in the Murder of the Century book review. The World, full of swagger, erected the first building taller than Trinity Church in New York City (in fact, the largest building in the world from 1890-1894). 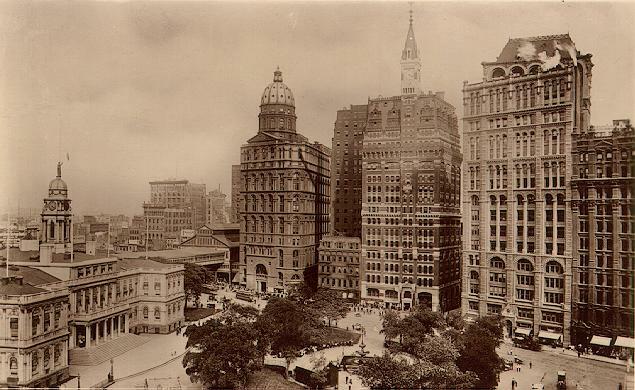 At the same time, the New York Herald made moves, setting up a spectacular building uptown at 34th street, which it persuaded the city to rename “Herald Square.” The New York Times, which had always been respectable, though not dominant, was acquired by Adolph Ochs in 1896, and was really starting to take off. Ochs needed a domain of his own. The New York World, Herald and Times, left to right, across from City Hall. Bridge. Photo from New York Architecture. 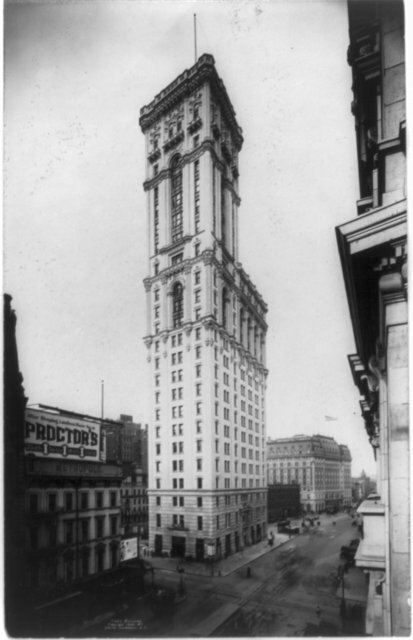 The New York Times purchased the Pabst Hotel (which is what it sounds like) between 42nd and 43rd, straddling Broadway and Seventh Avenue, and tore it down to build their fancy new office tower. Mayor George McClellan, perhaps best known for excitedly seizing and refusing to relinquish the reigns during New York City’s inaugural subway ride later in 1904, presided over the April 8 renaming ceremony. Woe be it for me to question Wikipedia, but it gets what happened next a little jumbled. The New York Times did not lobby the city to get a subway to come through Times Square. That already seemed to be in the works according to these original IRT plans. More likely, Ochs’ friendship with IRT president August Belmont (remember, the subways were originally private companies) clued him in to the wisdom of moving there. In fact, the subway actually ran through the basement of the Times building, and the original presses were underneath the subway. Times Square in 1905. Photo from Untapped Cities. In a humble-brag cover story on April 9, the Times explained the renaming, citing the confusion of a subway stop named “42nd Street” or “Broadway.” Of course, the subway stop could have just been called “Longacre Square,” which would have been abundantly clear. Ultimately, it seems that Ochs got an assist from Belmont and McClellan. Of course, as evidenced by my abysmal show at Amity Hall’s transit trivia last night, I am no MTA expert, so please correct me if my analysis is mistaken. For all the hoopla surrounding the Times moving to the completed new building in 1905, their run at that spot was not long. They were there long enough to throw the first Times Square New Years party that December, followed shortly by the first ball drop a few years later. In 1913 the Times moved to its current location around the way. Times Square became a glamorous tourist destination, replete with fine hotels and top theater. The rest is history, history for another time.